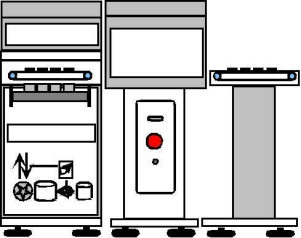 Drawing of a Dip Coating Machine Standard Offline semi-automatic. Feeding and removal of the components are realized through a lock with a conveyor belt. This lock can be switched for inlet and outlet. Here you can see a dip coating machine for particular Dip Coating. This machine has been customized. The efficiency and the output rate of this system can be increased by handling the coating job in a pendulum process, which is the simultaneous use of two separate dip baths and lacquer conveying systems. While one of the coating masks is loaded with work-pieces, the coating process runs in the other one and vice versa. Therefore, the output of the system is not only controlled by the process itself but is mainly determined by the loading and unloading efficiency. The machine is equipped with an extraction hood (option) that can be opened upward easily for a tool change. During the operation the hood remains closed and the operator can place the components on the coating tool through the front. The extraction hood forms an extraction unit in form of a “U” together with the back part of the operation area. So the solvents are exhausted efficiently. The hood has an angel of inclination of 45° and consists of a transparent ESD inspection glass. So the working area can constantly be observed by the operator. The applied illumination is ex-protected. On the right side is the material buffer with automatic removal of the magazines. These are introduced into the coating area through the lock which is necessary to avoid that humidity enters. After the coating the magazines leaves the coating zone through a lock. The “dealer” hands the magazine over to the material buffer. The process station has been designed as a dipping machine for DIL/SIL thick film hybrids. Feeding and removal of the components are realized through two handling systems and separate locks. The machine works completely automatically. 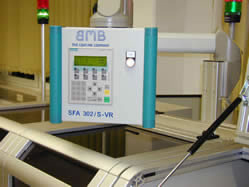 The process station has been designed for one-sided, selective conformal coating. It is possible to integrate the coating line to a complete production and assembly line by means of standard handling systems. The flip station turning the coated surface up has been built up with a standard module. The flipping mechanism has been designed that way that also PCBs with different sizes can be handled carefully. The vision system detecting the coated parts using a CCD colour camera system has been adapted for the application of a special fluorescent contrast medium of the lacquer system. 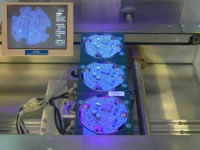 In this way, it was possible to reach a safety optical control using UV light. The capacity of the space-saving vertical drying system can be adapted to meet the costumer’s requirements using the vertical dimensions. The handling over of the components between the buffers arranged in series is realized continuously according to a programmable processing time. Drawing of the schematic run of the Select Flood Coating Machine Inline. 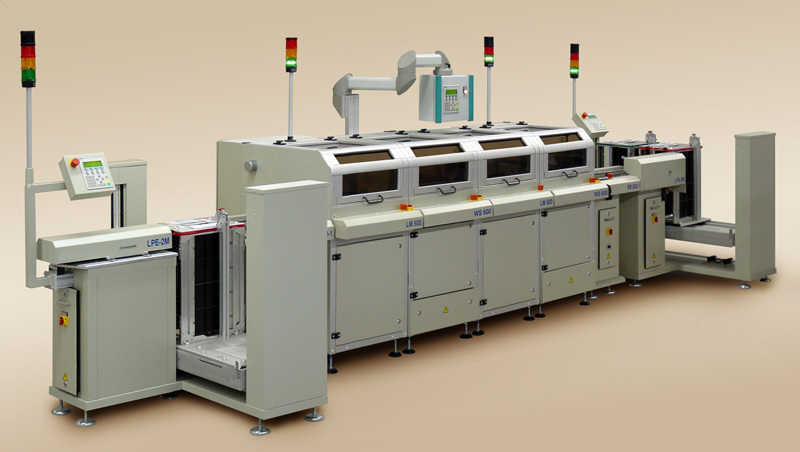 The coating machine as process station has been designed for two-sided selective conformal coating. 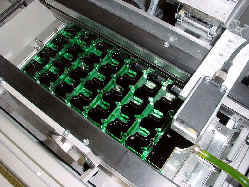 Magazine input station for two trays at 32 panels with type supervision. Two trays are in a changing table guaranteeing a change without production stop. Coating module 1 for coating of the solder side. The module consists of conveyor belt, Select Flood unit, viscosity regulator and coating guide to the second module. The peculiarity of this coating module is the application of a new type of ultrasonic lacquer level sensor. Here, the lacquer level is calculated during a teach-in process, preset through a central control unit and saved as a numerical value for the respective data record. First standard flip station to arrange the coated surface to the top. Coating module 2 for coating of the component side. Intermodule for manual removal of the components in case of failure. 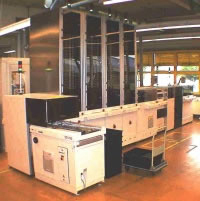 Magazine output station for two trays at 32 panels. The coating machine can be combined with a vertical or horizontal dryer.